You can even buy official Go Fish cards even though a standard deck is fine. 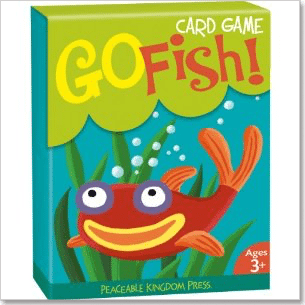 Everyone remembers playing Go Fish as a kid, the classic card game that provided hours of wholesome entertainment and made an appearance on every family holiday and camping trip. Although it doesn’t exactly spring to mind when thinking of card games you can gamble on, anything can be played for bets if you put the right spin on it. In case it’s been awhile since you played Go Fish, we’ve explained the rules to refresh your memory and provided an example of how to gamble on this much loved card game. The aim of Go Fish is to make the most sets of “books”. A book is a set of four matching cards based on the numbers/faces of the card (the suit is not important) for example four queens, four sevens, etc. You can even buy official Go Fish cards even though a standard deck is fine. and beat them to a match. It can be played with anywhere from two to six players and the more players means the greater the challenge. Typically Go Fish uses a standard 52 deck of cards, however as the game ends once all the cards have been matched you can technically use as many or as few cards as you want as long as there are even matches in order to make the correct amount of books. 2. The remaining cards go in a face down stack in the middle of the table, becoming the draw pile, or ‘fish’ pile. 3. Each player now looks at their cards. If they have any books they show this to the other players then take these out of their hand and put them aside. 4. Starting with the player closest to the dealers left, each player then takes turns asking one other player for a specific card, for example: “do you have any two’s?” You can only ask for a card if you already have a matching one in your hand. Only the player who has been asked is required to respond and they can’t withhold a requested card or its constituted as cheating. 5. The player whose been asked either responds by handing over the requested card if they have one, or telling the player to “go fish”. If the player does have your requested card, your turn continues and you can now request another card from any other player. Being told to go fish means your turn is over and you must then pick up a card from the draw pile to add to your hand and the game moves onto the next player. 6. Play continues like this around the table until all books have been collected. 7. If a player runs out of cards they may draw from the draw pile upon their turn and request cards of that rank. If there are no cards left in the draw pile the game is over for that player. 8. Once all books have been collected, the winner is the player with the most books. •	Each player simply places a standard wager to enter the game. The winner with the most books takes the entire prize pool. •	Alternatively, assign a value to each book based on its rank e.g. a set of face cards equals 10 points, a set of threes equals three points, etc. The winner is the player with the most points at the end of the game and takes the entire prize pool. •	You can add side bets, like an additional wager for the player who finishes their cards first or for the first player who collects a complete book. With no official rules or methods to gamble on Go Fish, enjoy the freedom of establishing your own betting methods. Can I play go fish online for real money? As Go Fish isn’t a traditional casino game, unfortunately you won’t find it at any of our recommended online gambling venues. Given its huge popularity with players of all ages, you’ll have absolutely no trouble finding Go Fish for recreational play at any free card game website, including Facebook Games, Google Play and within the app stores for either iOS or Android. As online gambling continues to soar in popularity, it may be possible that Go Fish will be added to the gaming repertoires of our favourite online casinos, but until then if you want to gamble on Go Fish you’ll have to organise the game yourself in real life.